Quality, service and value are the foundation of our corporate policy. As a result, you can expect the highest quality product, crafted for maximum possible life. We also believe in superb service to you, our valued customer. That is a promise from all of us at American Eagle Instruments. We make this promise of quality, service and value to you and to each other. We own our company and take pride in the honesty, integrity and craftsmanship which form our common bond. We invite you to try the employee-owned difference. You’ll be glad you did. American Eagle Instruments Inc. incorporated in January 1992, but our craftsmen and women have spent an average of over 20 years each building dental instruments. When the manufacturing facility where we plied our trade was purchased by a competitor and closed, a dream was born…to start our own company and continue building fine quality dental hand instruments. 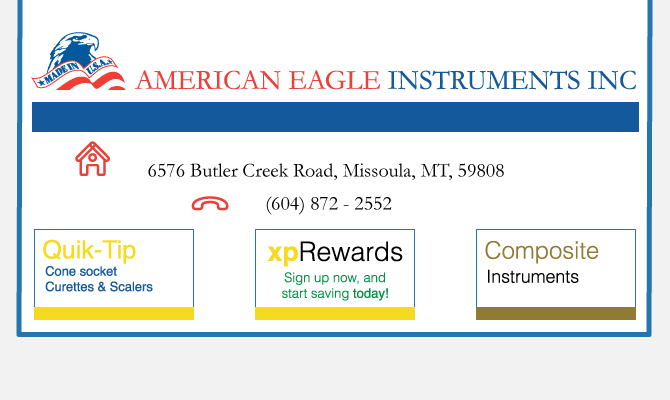 American Eagle Instruments Inc. also employs highly trained field sales representatives to service and support our clients. AEI’s professionally trained customer service representatives assist many dental offices around the country. With years of experience and continuing education, AEI customer service reps provide personal service and comprehensive product knowledge. As the employer of the finest industry professionals, AEI cares about its customers…from the first impression to the last.